Many want to play a professional sport because of the money, fame, and to achieve greatness. But for Massachusetts Pirates wide receiver Mardy Gilyard, it all started with a promise. Gilyard, a Florida native, knew at a young age what he wanted to do with his life when outside playing with his cousin. Sitting with fans after their most recent win against the Carolina Cobras, he highlighted his story during an autograph session. Gilyard set out to do just that when he received a full scholarship to the University of Cincinnati after earning numerous accolades playing at Flagler Palm Coast High School including the Class 5-A First-team, Class 5-A All-State selection, and MVP of the Florida Coast All-Star Game in 2005. He redshirted in 2006, his first season with the Bearcats, and won the Scout Team Special Teams Player of the Year Award. The following year, Gilyard played a few different positions including special teams, where he blocked punts in back to back games and started seven out of 12 games at wide receiver. In Gilyard’s final two college seasons, he would be named an All-American twice in 2008 as a kick returner and in 2009 at wide receiver. He featured in the Big East First-team twice in those same years as well as also being named Big East Special Teams Player of the Year. Gilyard waited but didn’t get a call on the first day of the 2010 NFL Draft, or the second day. But with the first pick in the 4th round, the then St. Louis Rams selected Gilyard. His first promise had been fulfilled. Determined and not forgetting what he said to his mother at the age of seven, he took the money he made with his rookie contract and put his plan into motion. His mother flew out to see her son play against the San Francisco 49ers and after the game, he sent a taxi to pick her up and brought her to his home where he fulfilled his second promise. In front of her was the car and a 17-year promise fulfilled. A man of his word, he told his mother why. “Mom I promised you when I was a kid I was gonna get you a car,” Gilyard said. “You sure did,” his mother said. With the end of the story, he gave one parting message to the young fans to give it your all no matter what you do. At 31-years-old, Gilyard brought spirit and determination to the Massachusetts Pirates that has rubbed off on the players including his quarterback Sean Brackett. Wide receiver Bones Bagaunte hasn’t just seen his teammate’s influence with the Pirates, but he has indeed felt it as the two have been as close as siblings, even playing together in college at Cincinnati. The physical and leadership aspects of Gilyard’s game trickled down to his head coach Ameer Ismail as well. 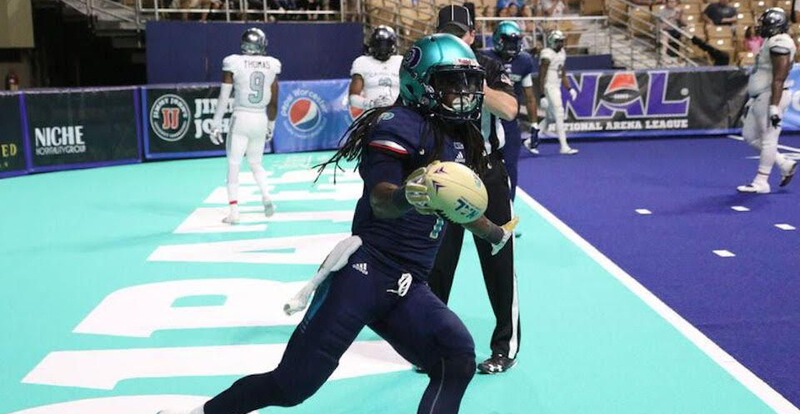 While Mardy Gilyard has not won a Super Bowl or been named to the Pro Bowl or given All-Pro honors, the journeyman receiver’s heart is full for accomplishing the mission he gave to himself with the promises he made to the ones he loved. 2 comments on "Mardy Gilyard: A Football Career Built on Promises and Brotherhood"
We helped to run Mardy’s “Gilyard Group Foundation” those first few years. He had such a smile when he gave out cleats to the young Pop Warner players who earned straight “A’s” on their report cards. Let me tell you how the number of honor students went up as the word went out. We had a food trailer at the International Speedway in Daytona for the Daytona 500 to help earn money for the foundation and watching Mardy at the grill doing burgers was a real sight. It’s been a lot of years since we all celebrated at his Gram’s house in Bunnell the day he made the draft. Mardy’s given us a lot of love – and a lot of smiles. After talking to him, that sounds just like something he would do. A pleasure to write this story.